This pen & ink cityscape drawing of the Chicago skyline #750A, which is a cityscape stylus sketch, is for sale at discount with prints by artist Stephen F. Condren, BFA-SAIC, of Condren Galleries, a Fine Arts Gallery, offering JPEG & PDF scans. 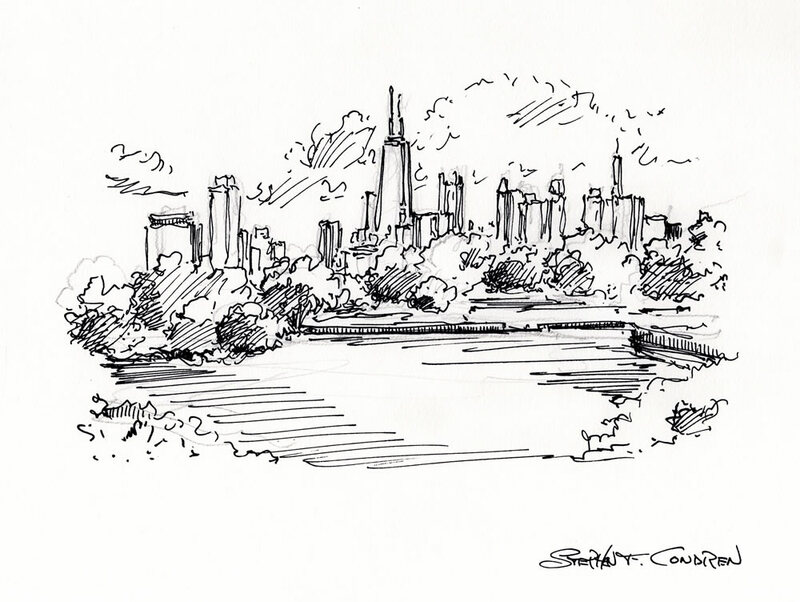 This cityscape drawing is of Chicago skyline #750B looking south over Lincoln Park. Closest to the park is the immediate skyline of the near north side with show 875 (former John Hancock Center). The linework in the drawing if very clean and clear. The use of hatching and cross-hatching is at a minimum so as to keep the forms of the park distinct from the skyscrapers. Effort has been taken to be as clear as possible without sacrificing quality draftsmanship.